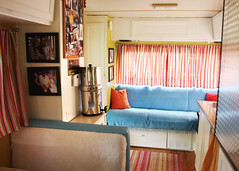 Live Lightly Tour » The Minnie Winnie! I LOVE it! I think I’m going to paint my laundry room that beautiful yellow! As always, you do a fabulous job, the both of you! Hey guys! I found your site as I was reading the Green RV article on the NY Times. I have to say…you guys are awesomeness. My boyfriend and I have been planning to do what you’ve already done within the next few months hopefully. The only problem we’re running into is finding a diesel rv for a relatively cheap price. I think the size of your minnie winnie is pretty perfect for us. Our rental lease is up in April so we’ll be searching until then. When are you coming to Oklahoma?? I’m sure you wouldn’t think of that first, but Norman, OK where we live is very very interested in sustainable education and my husband works/owns a solar energy company that would be happy to set you guys up with connections and networks here!! We would love to have your tour swing by.